Musculoskeletal disorders (MSDs) often involve the back, wrist, elbow, and/or shoulder, and occur when workers are exposed over time to MSD risk factors, such as awkward postures, forceful exertions, or repetitive motions. These exposures sometimes occur due to poorly designed workstations, tasks, and/or hand tools [Chaffin et al. 2006; Sanders and McCormick 1993; Silverstein et al. 1996, 1997]. Workers must understand the nature of MSD risk factors and how to avoid exposure to them. In a classroom setting, trainers may discuss ergonomic principles and show examples of MSD risk factors with photographs or videos. However, supplementing training with practical, hands-on demonstrations may further reinforce these ergonomic principles and help workers understand the importance of avoiding exposure to MSD risk factors. Moreover, demonstrations that allow for worker participation result in a greater understanding of the impact exposures to particular MSD risk factors have on workers’ bodies. 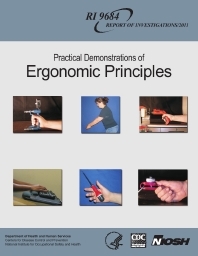 This document consists of a series of demonstrations designed to complement training on ergonomic principles. A description of the materials needed and step-by-step methodology are included in this document. Each demonstration highlights worker participation and uses relatively inexpensive materials. The demonstrations are organized by type of ergonomic principle. Five general topics are addressed: 1. Neutral compared with non-neutral postures; 2. Grip types; 3. Hand-tool selection and use; 4. Fatigue failure and back pain; and, 5. Moment arms and lifting.